I thought that this might be interesting to other basket cases out there. 30 troy ounces of sterling silver. I don't know how historically representative the hilt is, but it sure looks spectacular. More at Garth Duncan's site. I'm not much of a basket case, but I kind of like that one. The grip looks a bit too beefy, and I could do with a slightly smaller pommel nut, but otherwise, definately not something I would turn my nose up at. I've always liked silver... who needs gold when they can have silver? Wow! That's an oldie but a goodie. I remember reading about that baskethilt way back when SFI was a fledgling offshoot of the Highlander Sword Shoppers Guide. Back then, Garth Duncan was living in the U.S. There is an article about it originally published in the old SFI webzine. Anyone else remember that? Damn, I feel old. I got a chance to see this thing first-hand many years ago at a Scottish games event here in the San Francisco Bay Area. It's quite beautiful! It's mounted on an antique blade, if I remember correctly. If memory serves, you're right, it was indeed mounted on an antique blade. Yes. In fact, the notes on this page of Mr. Duncan's site state, "The pictures show the hilt mounted on an antique blade." And the page also says "Rob of Castle Keep is designing a handforged Fararra reproduction blade to complement this hilt. When his blade is ready I will be happy to offer the combination on a very limited basis...."
We were going to put together a joint project since we work on the same premises,i have'nt made the blade yet,and Garth hasn't made the basket,we have both been too busy,the usual excuse. I shall be working on a new style of Basket hilt myself over the next couple of weeks,so i hope to get a chance to post up some pics either here or on my forum. Garth has been here on Skye for around 5 years now,he is getting even better as he goes along,a remarkable maker with an attention to detail that you just cannot find anywhere else in Celtic workmanship,check out his Jewellery. Another style of basket hilt available from Castle Keep? That sounds very interesting, Rob. I look forward to see what you have coming, and I am sure that is true of other "basket cases", here, as well. I suspected that you and Garth might be at the same location - that looks like a fabulous place! And, from the photos on his site, I agree that Garth's jewelry looks beautiful and finely crafted. 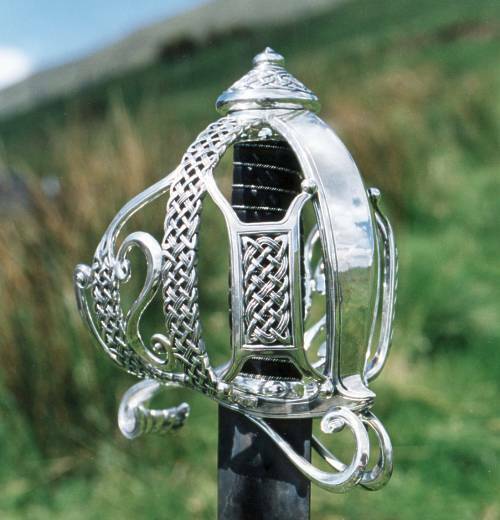 Another style of basket hilt available from Castle Keep? I want to create a more elaborate sword with more detail and profile work,more of a Chieftains sword than a Foot Soldier,i will post up some pics in the next couple of weeks. That basket looks lovely! I've also read both at SFI magazine (and strangely I don't feel old :P )and on Garth's website. Rob, that sounds interesting. I look forward to seing pics of your new basket style.